The Slack integration provides all information in a preview to make the candidate screening process as smooth as possible. 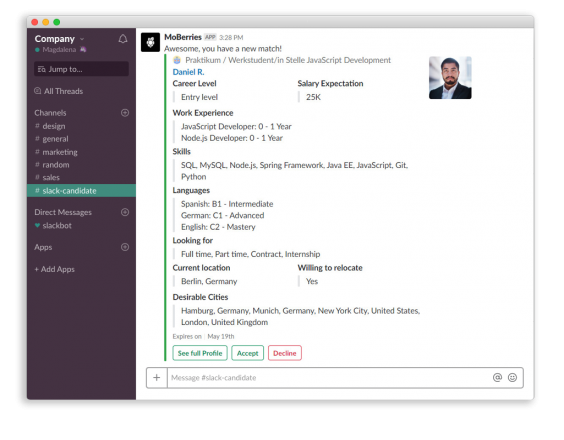 Besides giving you information about the candidate’s skills and experience, it also allows you to accept or decline a match directly within Slack. You need more information about the candidate? No problem, you can easily view the full profile as well. This is how a new application will look like when posted to your Slack channel. 1. Simply login into your MoBerries company account. 2. Navigate to the "More > Integrations" section in the main menu. 3. Select "Slack" from the list of possible integrations, and click on the "Connect" button. 4. Every member of your organization can connect MoBerries to a Slack channel. You will see the Slack connection view, where you can select the Slack channel you want the new applications to be posted to. We advise that you create a dedicated Slack channel, e.g. MoBerries-candidates and share it with your teammates.